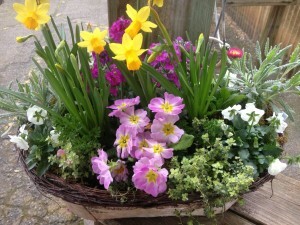 More Blooms (and some herbs) for February! 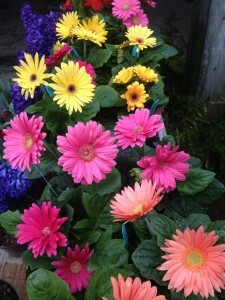 These gerbera daisies could brighten anyone’s day! They are the perfect addition to mixed baskets and centerpieces for a lively pop of color and also make for lovely thinking of you gifts. Remember also that plants like this will last longer than cut flowers and you can try planting them in your garden come spring – they need a sunny, quite well drained spot if you want to give it a shot. We also have a few herbs in stock now – always a fun addition to mixed containers. This basket shows some silvery lavender and a trailing thyme adding their foliage color, texture and scent to this arrangement. Our baskets are still on sale, by the way – buy one get one free. Stop in and take a look! This entry was posted in Arrangements, Baskets, Container, February, Flowers, Gifts, Herbs, Sale, Uncategorized and tagged arrangements, centerpiece, color, containers, flowers, gerbera daisies, gifts, lavender, thyme on February 5, 2013 by Kris Blevons.